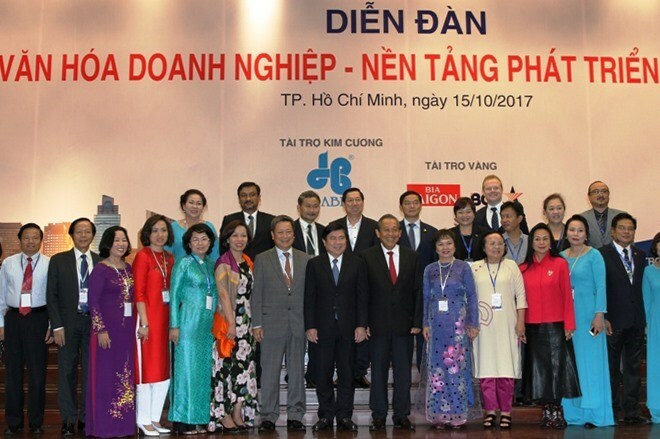 Hanoi (VNA) - Deputy Prime Minister Truong Hoa Binh has urged businesses to develop corporate culture, a factor critical for brand building and sustainable development. Binh was speaking at a forum about corporate culture, jointly held by the Vietnam Association of Corporate Culture Development and the HCM City Women Entrepreneur Association in the southern city on October 15. Binh said corporate culture should be regarded as the decisive factor for sustainable development of any firm and of the whole economy for rapid international integration. “A good brand is not only an asset of the company, but also of the country,” he said. However, the development of corporate culture among Vietnamese businesses remained limited, especially in the building of business ethics, which created stinging social problems. Many firms, for profits, violated regulations, such as selling fake and poor-quality products. This was causing economic losses and undermining consumer confidence in Vietnamese goods. Bình urged businesses to strive towards building corporate culture, complying with established laws and healthy competition. The Government would assist businesses through the efforts to enhance the legal institution, hastening administrative reform and improving business climate and competitiveness, Binh said. In addition, violations would be strictly penalised to create favourable conditions for businesses to start, develop and renovate. Nguyen Thanh Phong, Chairman of the municipal People’s Committee, said the city wanted firms to share difficulties they faced in building corporate culture, through which support would be raised to help firms develop sustainably. HCM City currently has some 323,000 firms, more than 98 percent of which were of micro and small scale, however, most failed to build corporate culture. According to Cao Ngoc Dung from Phu Nhuan Jewelry, Vietnamese firms should cooperate with each other to grow instead of competing in an unhealthy manner. At the conference, the Vietnam Association of Corporate Culture Development announced the setting of standards for corporate culture, which included six criteria -- culture of leadership, building and implementing corporate value, law abidance and business ethics, as well as social responsibility and healthy competition.